On Thursday 2nd March at 7.30pm the Mosaic Choir will be holding a fundraising concert for the work of Fr Themi Adamopoulos, missionary in Sierra Leone. The venue is the Greek Orthodox Cathedral of the Dormition of the Mother of God (St. Mary’s), Trinity Road, Wood Green, London N22. Father Themi will also speak briefly about his mission and work with Ebola orphans. Father Themi will also be visiting Oxford and Birmingham. During the time of the Beatles and of the Rolling Stones, he managed to form his own musical group, The Flies. From the seminar halls of the School of Political Science of the University of Melbourne, he found himself singing next to Mick Jagger, and so realized his dream, but now he is a missionary in Africa. 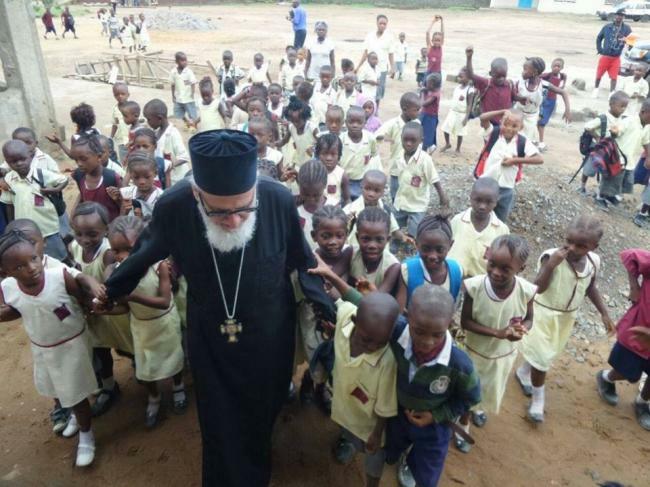 Then in 2007, the new Patriarch of Alexandria, Theodore, who had followed the work of missionary and humanitarian Themis Adamopoulos in Kenya, ordered him to go to West Africa, to Sierra Leone, where a 12 year civil war had devastated the whole region leaving behind untold horrors, where death is a part of daily life. He lives there, next to the people and among to the people. “Over there we are building a village for 100 disabled people who were begging in the streets and the police would chase them away”. Father Themi, carried on his mission right through the worst aspects of the Ebola crisis that had started in March 2014. He tried to help in anyway he could. Now the crisis is thankfully over, but Father Themis continues with his work – now building orphanages for those who tragically lost all the adults in their family from the epidemic. All this work is financially supported by two major charities in Australia, Paradise Kids 4 Africa and Paradise 4 Kids (Australia). Mosaic Choir brings festive cheer! On Friday the 16th of December the Mosaic Choir brought the spirit of Christmas to North London with a beautifully executed and uplifting performance of traditional Christmas songs and Carols from Greece, Russia, Romania, Serbia and other places around the world, spreading the joy of Christmas. Voices were wonderfully balanced and blended, often accompanied by folksy recorder pieces masterfully played by Rebecca Vucetic. Story teller, Anna Conomos, gave helpful introductions telling the story of the song and the meaning behind the words. The choir performed a full range of music from peaceful hymns to foot tapping Balkan carols, rounded off with a stunning encore of Gaudete, sung with wonderful dynamics from sotto voce to a rousing final chorus. The choir were warmly received with a standing ovation and loud applause – it really added a bit of warmth to a cold winter night. They were hosted by the Greek Orthodox Cathedral of Saint Andrew, and the concert was attended by Bishop Chrysostom of Kyanea and introduced by Priest Kristian Akselburg – who warmly thanked the choir. At the end a charity collection was held – the proceeds to be shared between charities supported by the Fellowship and also the Cathedral’s Christmas almsgiving. Here is a brief taste of the concert through some amateur videos. Come to a Carol Concert with a difference! Experience a concert with a true international flavour which will have some familiar favourites but also a real international and folk feel, with carols from Romania, Greece, Ukraine, France and other countries, too. The Mosaic Choir was formed under the umbrella of the Fellowship of Saint John the Baptist and is made up of Orthodox people from a variety of backgrounds: cradle Orthodox and converts, and from countries all over the world! We also sing liturgical Christmas music from different traditions, during what will be a very relaxed evening. If you’re in London and want a unique musical experience for Christmas come along and tell your friends!